Embark on a hike and sail along the Caledonian Canal, cross country from Inverness to Fort William. The Great Glen Way is a beautiful valley walk stretching 72 miles through Inverness via Loch Ness to Fort William. 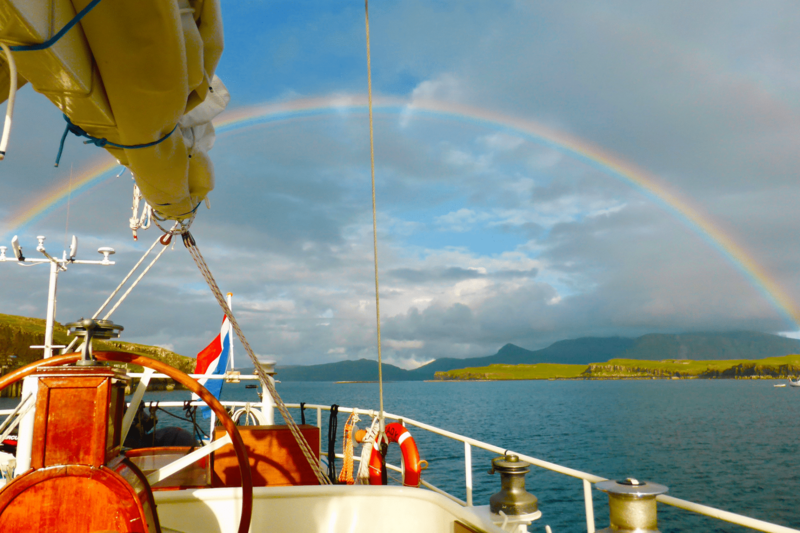 On this voyage, you’ll be combining walking with sailing, as you complete sections of the hike each day and come aboard in the evenings to sail a little further down the loch and admire the mountains from the sea. The tour starts in the historic city of Inverness, where you’ll have time to explore its history until you come aboard at 3pm. Steady is already on the Caledoninan Canal in Muirtown Marina, which is easy to find. You’ll celebrate the beginning of your holiday onboard with a stunning home-cooked meal and good wine, and you’ll get the chance to meet your fellow travellers. Be sure to bunk down for the night early as tomorrow will be a big day hiking. Meandering through forest footpaths, and emerging on the towpath along the Caledonian Canal, you’ll be walking a small section, passing by serene lochs and hopefully spotting some amazing wildlife on your 18 mile journey to Drumnadrochit. For the less experienced walker, it is lengthy and you’re bound to feel tired by the end of the day, but it’s an ideal introduction to long-distance hiking as it doesn’t have too many ups and downs! The walking isn’t guided (we’re busy sailing the boat along the canal to meet you later) but the navigation isn’t a challenge, as most of the walk is signposted. After your day hiking, we pick you up from the shores of Loch Ness in the dinghy, bringing you aboard for a hearty, well-earned meal. We’ll anchor for the night with a view of Urquhart Castle. On day 3, you’ll get to explore the castle in the morning, before we set sail down the loch to Fort Augustus. 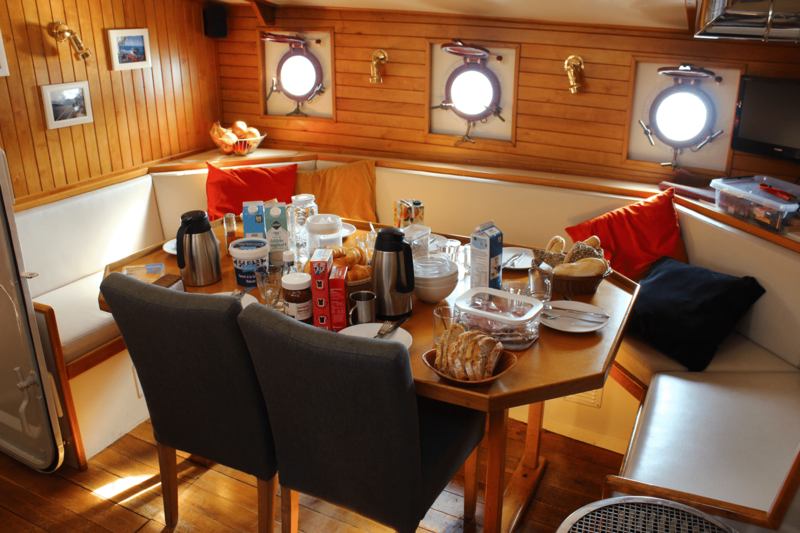 Help out on the boat as little or as much as you like – get stuck in or relax with a book. It’s your holiday after all. On day 4, you’ll walk from Fort Augustus to Laggan, admiring the wild shores of loch Oich and passing through gentle woodland paths on mostly flat ground. It’s under 10 miles, so you’l have more chance to relax on the boat in the later afternoon, all being well. After a hearty breakfast to fuel you up, day 5 sees a slightly longer hike from Laggan to Gairlochy, punctuated by the stunning views of loch Lochy, Scotland’s 3rd deepest loch. By day 6, you’ll be as fit as a fiddle – you won’t even notice the miles go by as you hike from Gairlochy to Corpach, a small village north of Fort William. you’ll get views of Ben Nevis on the way – Britain’s highest mountain, whose name translates roughly to ‘Poison Hill’ -and for good reason. Celebrate your last night on board and feel proud of the fact you just walked 85km! Day 7 sees your departure after a continental breakfast – keep in touch with those amazing friends you’ll have made over your time away; you might even come back and do it all again next year. Whilst hiking is a part of this voyage that many people love, there is always the option to stay on board and sail with the crew if you don’t fancy it.